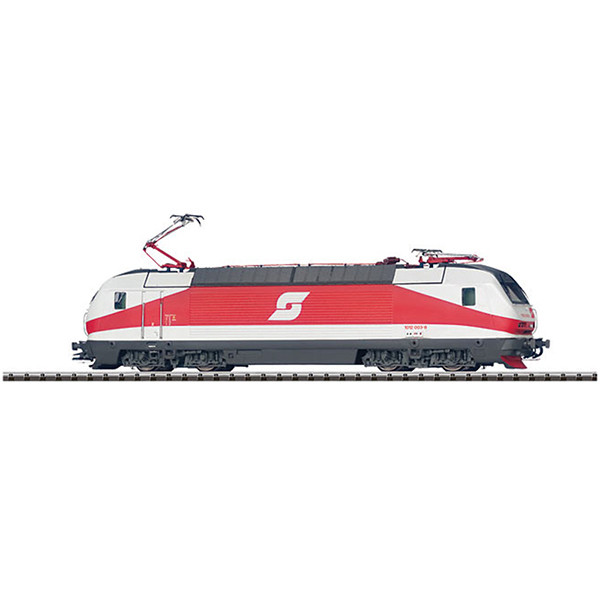 Prototype: Austrian Federal Railways (ÖBB) class 1012 express locomotive. Built in 1997 by SGP, ELIN, and Siemens as a series of 3 prototypes. Road number 1012.003-8. Use: Test runs, also in regularly scheduled service. Model: Era V. The frame is made of die-cast metal. The locomotive has a 21-pin digital connector. The locomotive has a centrally mounted 5-pole can motor with diagonally offset commutator segments and with a flywheel. All 4 axles are powered through cardan shafts. The headlights are maintenance-free warm white LEDs, and they will work in conventional operation. The regular and long distance headlights can be controlled digitally when a 66839 decoder is installed. The locomotive has separately applied grab irons and many other details. It also has detailed roof equipment. The engineer's cabs have interior details; the front one has a figure of a locomotive engineer. The locomotive has NEM coupler pockets and a close coupler mechanism. The couplers can be replaced by closed end skirting. Brake hoses can be installed on the locomotive. Length over the buffers 222 mm/8-3/4. This model is available with 2 road numbers: Item no. 22600 is 1012.002-0, item no. 22601 is 1012.003-8.